The Lonely West Traveling Gun Show! Yep it’s the National Day of the Cowboy at the Historic Jefferson Railway. On Friday July 26th and Saturday July 27th, 2013 the Train Depot is hosting the event this year. 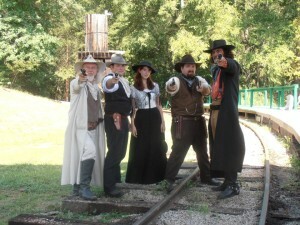 There will be day and evening train rides complete with Cowboys but you better watch out there is talk of a take-over. I’m betting those villains won’t get away with a train robbery though. No matter how hard they try. This family fun getaway begins on Friday at 8PM and again on Saturday at 2:30, 4:30 and 8:00PM. The Jefferson Railway has more information for you. This entry was posted in Summer Events, Train Ride by Tammy D. Bookmark the permalink.